The US’ largest private employer, Walmart, announced pay rises for 1.2 million employees, bringing wages up to at least $10 an hour. The news comes just five days after the company announced it was closing 154 stores in the US and laying off 10,000 people. Walmart had previously announced the pay increases as part of a $2.7 billion investment in pay, training and benefits, but the details weren’t disclosed until Thursday. Under the plan, most full-time employees will see their wages increased by $1 – to $10 an hour. The company said the investment in wages was depressing profits, but it believes that better pay is leading to improve service and boost US sales. “We’re seeing strong increases in both customer experience and associate engagement scores,” said Judith McKenna, Walmart’s chief operation officer in a statement, according to Reuters. Walmart employs 1.4 million people in the US. The latest raises would increase the average full-time hourly wage at Walmart to $13.38 from $12.96, and the average part-time wage to $10.58 from $10. The federal minimum wage is $7.25. The announcement arrives five days after the multinational retail corporation announced it was closing 269 stores worldwide, 154 in the US, and laying off 16,000 employees, 10,000 of whom were in the US. “Walmart greed knows no bounds. They just closed hundreds of stores, destroyed thousands of jobs, and devastated countless small communities, but now they are trying to convince America they’re giving our workers a raise?” said Making Change at Walmart, a national campaign run by the United Food and Commercial Workers International Union, in a statement. Jessica Levin, a spokeswoman for Making Change at Walmart, told Reuters that she is skeptical that workers will see much of a change. She said after the pay increases last April, workers saw their hours cut. For Walmart workers who make more than the minimum wage, the raise simply advances the yearly increase they would typically get on the anniversary of their hiring date. New store employees will have to go through six months of training before qualifying for $10 an hour. New hires will also be able to earn paid time off after 90 days of employment, instead of a year or more. In December, Walmart was accused of squandering 400,000 jobs in the US economy based on its “huge reliance on Chinese imports.” On Black Friday in late November, thousands of Walmart employees in the US demonstrated at more than a dozen stores nationwide in their latest attempt to convince the retail giant to boost pay to $15 per hour for full-time employees, among other demands. Walmart also announced that workers would be able to carry over paid days off from year to year, with full-time employees transferring up to 80 hours into a following year. 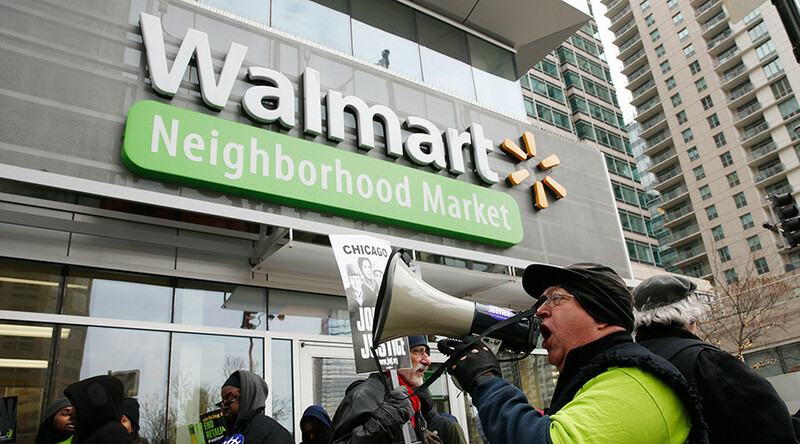 “At least they are recognizing that the longtime workers who are already making more than $10 need something,” Tyfani Faulkner, a former Walmart employee and one of the leaders of OUR Walmart, a group seeking better wages and benefits for retail workers, told the Wall Street Journal. “I still don’t think 2 percent is enough” for employees that don’t make enough to begin with, she said. Walmart employs 2.2 million workers worldwide at 11,600 stores in 28 countries. Fiscal year revenues in 2015 were $485.7 billion, according to Walmart.